1. "Sri Rama Jaya Rama” Mantra was chanted during Deepa Pooja, Shivalinga Pooja and daily by our Balwadi school children, cultural class students and during monthly meetings by our Balwadi teachers and Social Workers. Every month nearly 7, 54,238 times mantras were chanted in 84 localities. 2. Through 74 Balwadis, 2,046 rural Children were nurtured. In all the Balwadis, Malt along with hygienically prepared highly nutritive lunch with vegetables was served during the day. And in the evening vitamin-rich cereals were provided to the children. 3. In our Medicare Programme, 2074 patients were examined and treated for various common ailments, through 14 Rural Medical Centers in Kanyakumari, Nellai and Thoothukudi districts. 4. Eye camps were conducted at 3 places, in Kanyakumari, and Nellai districts in which 689 were treated for their eye ailments and 151 were operated for cataract. 29 persons given eye drops and 39 persons given spectacles. 5. 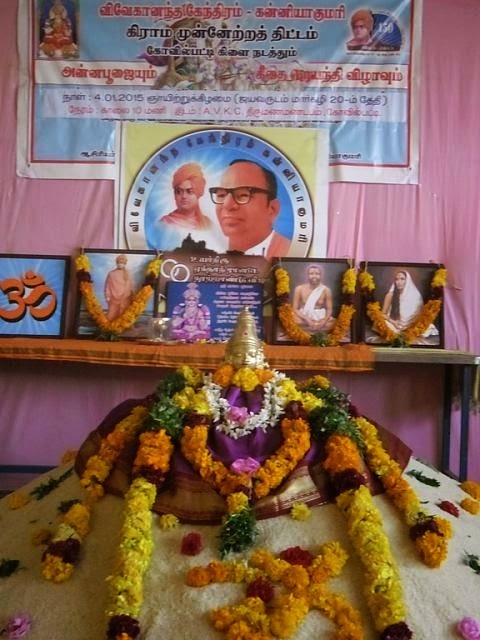 In 197 Samskara Vargas, 7604 students participated. The students were taught about the values of Indian Culture, through games, lectures & lessons. The feelings of oneness were strengthened among participants, through patriotic songs and games. 6. Under Adopt a Grannie Programme, 28 destitute and old people were provided with monthly solatiums, in the form of rice, dhal, oil, etc., for their livelihood and 110 persons provided rice only, in Southern four districts of Tamilnadu. 7. Monthly Deepa poojas were organized in 216 village temples in five districts of Southern Tamilnadu, in which 10545 ladies participated and offered prayers for the welfare of self, family and the society. 8. Under Amrita Surabhi Scheme, our Kendra workers collected 897 Kgs of rice from five districts. 10. Vivekavani Subscriptions for 83 for one year. 11. 80 women are being benefited in 4 Self Help Groups in Kanyakumari district. 12. Yoga Varga has been conducted at 02 places, Kovilpatti and Aruppukottai in which 26 persons attended. 14. 4 tailoring units are functioning well in Nellai & Kanyakumari districts with the total attendance of 81. 15. Shivalinga Poojas were conducted at 03 places in Kanyakumari District and 206 members participated. 16. Durga Pooja was conducted at 03 places, in Kanyakumari District in which 195 devotees participated. No.of.Parents –39, Teachers – 10. 19. Vacs Hr.Sec.School Level Girls Camp was conducted at Kanyakumari from 31.12.2014 to 03.01.2015 students from 55 Schools 23 parents, 11 Teachers participated in this camp. 20. Vacs College Girls Camp – I was conducted at Kanyakumari from 22.01.2015 to 25.01.2015. 130 students from 17 Colleges 3 parents and 9 Professors participated in this Camp. 21. Mathru Pooja was conducted in Kovilpatti and Mannarkovil where 90 parents and teachers participated. 22. Geetha Chanting was performed at 26 places in 3 district and 2185 devotees attended. 23. Cultural Class conference were held in Pudhukottai, at Thoothukudi district during January 2015. Nearly 50 students participated in the functions. 24. Swami Vivekanandar Jeyanthi Vizha was performed at 95 places in 5 district and 14385 devotees participated. 25. Anna Pooja and Geetha Chanding was performed at Kovilpatti and 100 devotees participated in the function and rice collection up to 2000 kgs was collected. 26. Anna Pooja was performed at Ramnad district and 300 devotees participated in the function and rice collection up to 6000 kgs was collected.